The Cochimí were the aboriginal inhabitants of the central part of the Baja California peninsula, from El Rosario in the north to San Javier in the south. They spoke a set of dialects or closely related languages that have been classified in a variety of ways. The most prominent division, between Northern Cochimí and Southern Cochimí, has generally been put to the south of San Ignacio (Mixco 1978, 1979, 2006; Laylander 1997). At one time designated "Peninsular Yuman", Cochimí bears an evident relationship to the Yuman languages of northern Baja California, southern California, and western Arizona. Mauricio J. Mixco (1978, 2006) reassessed this relationship and judged it to be too distant for Cochimí to be included within the Yuman family proper. He placed Cochimí as a sister language to the Yuman family, thus forming the Yuman–Cochimí family. The Cochimí were first encountered by Spanish seaborne explorers during the sixteenth century, including Ulloa, Cabrillo, Vizcaíno, and others. Sporadic encounters continued until the Jesuits established missions on the peninsula in the late seventeenth century. Eusebio Francisco Kino made an abortive foundation at San Bruno, to the north of Loreto, in 1683-1685. Juan María de Salvatierra began the first successful mission in 1697 at Loreto among the Monqui, who were southern neighbors of the Cochimí. This was quickly followed by Francesco Maria Piccolo's Cochimí mission at San Javier in 1699. Over the next seven decades, the frontier of Jesuit control over the Cochimí gradually extended northward, with missions at Mulegé (1705, Comondú (1708), La Purísima (1720), Guadalupe (1720), San Ignacio (1728), Santa Gertrudis (1751), San Borja (1762), and Santa María (1767). After the Spanish crown expelled the Jesuits from Baja California in 1768, the Franciscans under Junípero Serra established an additional mission at San Fernando Velicatá (1769) on their way north to Alta California. The Franciscans' successors in Baja California, the Dominicans, created the final new mission among the Cochimí at El Rosario (1774). Decimated by epidemics of Old World diseases, the Cochimí population declined, until sometime in the nineteenth or possibly the early twentieth century their language and traditional culture became extinct. The fruit of pitahaya cactus provided a highly valued but short-lived seasonal food resource. Subsequent to the pitahaya harvest, Baja Californians winnowed undigested pitahaya seeds from their own dried excrement and then roasted and ate this "second harvest". Another unusual food trait was the maroma. A valued morsel of meat was tied with a string, swallowed, then pulled back up and passed to the next person in a circle of consumers, until the meat finally disintegrated. Tablas were wooden tablets with painted designs and/or drilled holes, used in religious ceremonies. Some of these artifacts have been found archaeologically (Massey 1972; Hedges 1973; Meigs 1974). Capes made from donated human hair were worn by shamans on ceremonial occasions (Meigs 1970). Information on Cochimí customs and beliefs has been preserved in the brief observations by explorers but, above all, in the writings of the Jesuits (Aschmann 1959; Laylander 2000; Mathes 2006). Particularly important and detailed are the works of Miguel Venegas (1757, 1979) and Miguel del Barco (1973). 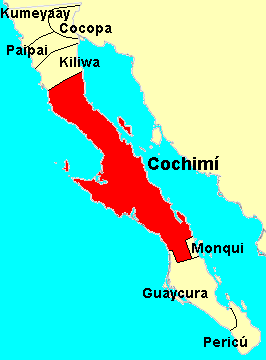 The Cochimí language was part of the Yuman–Cochimí family. Aschmann, Homer. 1959. The Central Desert of Baja California: Demography and Ecology. Iberoamericana No. 42. Berkeley, California. Barco, Miguel del. 1973. Historia natural y crónica de la antigua California. Edited by Miguel León-Portilla. Universidad Nacional Autónoma de México, Mexico City. Hedges, Ken. 1973. "Painted tablas from northern Baja California". Pacific Coast Archaeological Society Quarterly 9(1):5-20. Laylander, Don. 1997. "The linguistic prehistory of Baja California". In Contributions to the Linguistic Prehistory of Central and Baja California, edited by Gary S. Breschini and Trudy Haversat, pp. 1–94. Coyote Press, Salinas, California. Laylander, Don. 2000. Early Ethnography of the Californias: 1533-1825. Coyote Press, Salinas, California. Massey, Lee Gooding. 1972. "Tabla and atlatl: two unusual wooden artifacts from Baja California". Pacific Coast Archaeological Society Quarterly 8(1):25-34. Mathes, W. Michael. 2006. "Ethnohistoric evidence". In The Prehistory of Baja California: Advances in the Archaeology of the Forgotten Peninsula, edited by Don Laylander and Jerry D. Moore, pp. 42–66. University Press of Florida, Gainesville. Meigs, Peveril, III. 1974. "Meigs on tablas". Pacific Coast Archaeological Society Quarterly 10(1):37-38. Mixco, Mauricio J. 1978. Cochimí and Proto-Yuman: Lexical and Syntactic Evidence for a New Language Family in Lower California. University of Utah Anthropological Papers No. 101. Salt Lake City. Mixco, Mauricio J. 1979. "Northern Cochimí Dialectology and Proto-Yuman". Journal of California and Great Basin Papers in Linguistics 1:39-64. Mixco, Mauricio J. 2006. "The indigenous languages". In The Prehistory of Baja California: Advances in the Archaeology of the Forgotten Peninsula, edited by Don Laylander and Jerry D. Moore, pp. 24–41. University Press of Florida, Gainesville. Rogers, Malcolm J. 1945. "An outline of Yuman prehistory". Southwestern Journal of Anthropology 1:167-198. Venegas, Miguel. 1757. Noticia de la California y de su conquista temporal, y espiritual hasta el tiempo presente. 3 vols. M. Fernández, Madrid. Venegas, Miguel. 1979. Obras californianas del padre Miguel Venegas, S.J. Edited by W. Michael Mathes, Vivian C. Fisher, and Eligio Moisés Coronado. 5 vols. Universidad Autónoma de Baja California Sur, La Paz.